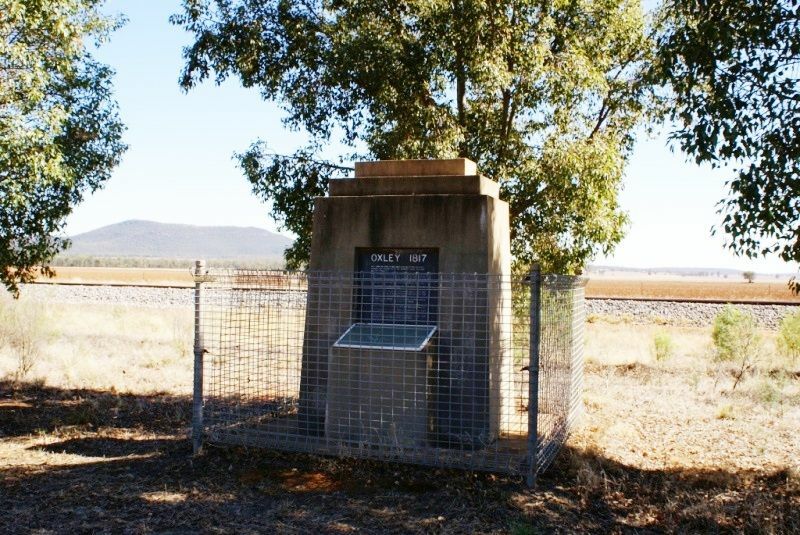 A monument commemorates the exploration journey of John Oxley and his party in 1817. 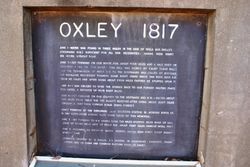 John Oxley and his expedition were the first white men to penetrate inland Australia outside of the Bathurst district. Extracts of Oxley's journal are included in the memorial with an entry indicating that of the 3rd June 1817 they found a small waterhole under Mount Brogden, now Mount Binya where Allan Cunningham planted the acorn, quince and other fruit stones to commemorate the situation. June 3 - Set forward on our route, for about four miles and a half, when we ascended a hill on our right. - This hill was named Mt. Caley (Cave Hill) and the termination of Peels Rge. to the southward was called Mt. Brogden (Mt. Binya.) - We proceeded towards some burnt grass which had been seen S. E. from Mt. Caley, and after going about four miles farther we stopped upon it. June 4 - I was obliged to send the horses back to our former halting place for water, a distance of near eight miles. 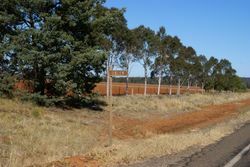 Exact position of the explores most southern station is across Binya Ck ( a dry depression) approx. sixty chain south of this memorial. June 9 - Returned to previous water. Horses having been forty eight hours without same. Situation verified by G. Faulks, R S Griffith in honorary capacity, from latitude, and or chain and compass plotting from Mt. Caley. 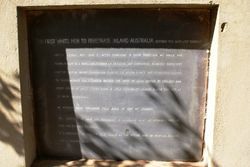 The first white men to penetrate inland Australia outside of the Bathurst district. Oxley`s journal 1817. June 3 - After searching in every direction, no water was found, except in a small hole under Mt. Brogden, and containing scarcely sufficient for the people - Where Cunningham planted the acorn, quince and other fruit stones, to commemorate the situation should the spot be again visited by civilized man. An extract from explorers field book at end of journey.